← Need ICD-9 help for your RHIT? Medical billers and coders spend quite a bit of their day posting charges and payments or calling insurance companies to check status. Does anyone actually know how long it takes to get the claim paid? We all have an idea from seminars and consultants or articles we may have read from time to time, but what is that time really based on? If you would like to be listed as a Research Contributer, this work study is simple. Just pick a random claim and use this form to track each minute spent on the various processes involved – all the way to a zero balance. It may take six months or longer, but I’ll keep everyone who signs up to help informed of the progress along the way. If you are interested, I must know you are participating and you should choose a claim with a date of service ranging from June 1 – June 15 of 2014. This way I can keep track and know when all final submissions have been received. Add your email here or send me a private message if you would like a copy of the .pdf. Thanks for considering this project and please feel free to share with other billers and coders so we get as much data as possible! 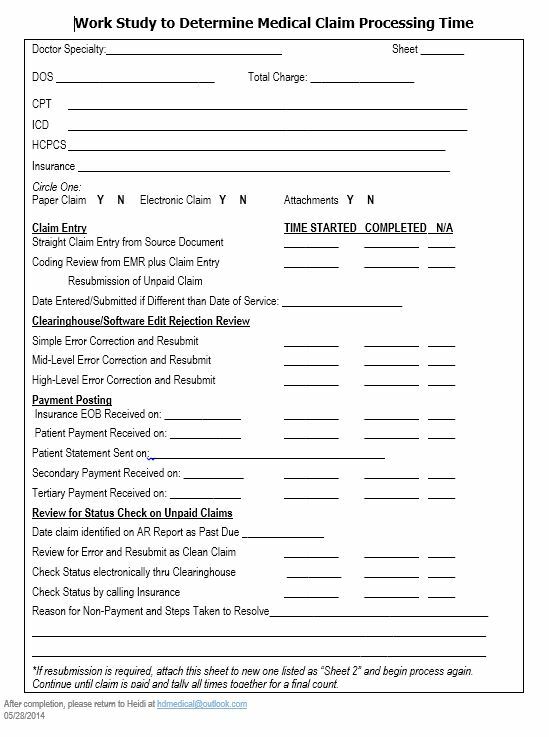 This entry was posted in Medical Billing and Coding and tagged AHIMA, AHIMA Approved ICD-10-CM Trainer, cheat sheet, CMS-1500, CPT, healthcare consulting, HIM, ICD-10, ICD-9, ICD10Watch, Medical Billers, medical billing, Medical Billing Services, medical coding, medical office manager, medical practice management, Remote coders, Revenue Cycle Management, RHIT. Bookmark the permalink. 1 Response to Will this study help Medical Billers and Coders get claims paid?